The rapid evolution of enterprise storage technologies, combined with external forces, like the explosion of big data, can cause Linux® and server administrators to play catch-up when it comes to storage. Running a bunch of monolithic storage devices and proprietary, disconnected technologies forces administrators to spend valuable time creating and managing complex solutions. To reduce complexity and enable rapid deployment of new technologies and applications, server administrators need a single open and extensible data storage platform. This storage platform must span physical, virtual, and cloud resources to support the various environments they currently manage and to provide a common repository for all unstructured data. 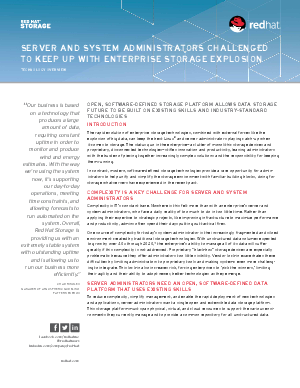 Read this whitepaper to learn how administrators are leveraging their existing skills to simplify the management of storage and servers.